SEBRING, Fla.— Twenty-one years to the day that race driver Wayne Taylor won the Twelve Hours of Sebring after winning the Rolex 24 at Daytona, race team owner Wayne Taylor got to congratulate his sons Ricky and Jordan, and team mate Alex Lynne, for performing the same feat. The Taylor brothers and Lynne drove the #10 Wayne Taylor Racing Konica-Minolta Cadillac DPi V.R across the finish line 13.6 seconds ahead of the #5 Mustang Sampling Cadillac, and two laps ahead of the similar #31 Whelen Engineering car. The Cadillac is the class of the field—the series has tried to slow it dion by cutting its power or adding drag, but the car is simply the best-developed of all the prototypes. That doesn’t explain with the WTR car keeps beating the identical Mustang Sampling and Whelen cars. That comes down to racing luck, and it comes down to the team—a fact the drivers well understand. Alex Lynne is new to the team, brought in to replace Max Angelelli and Jeff Gordon for the endurance races. Though the team didn’t qualify well, starting sixth, the car ran strong through the two-thirds of the race. In the final four hours, the team swapped the lead with the #5 Mustang Sampling car, and dominated the final fifty laps, losing the lead only on pit stops. Different cars had different set-ups. Some were strongest during the heat of the day, and some—like the Wayne Taylor car—came on as the track cooled. The formula for victory in an endurance race is to stay close until the final two stints, and then come on strong, and that is exactly how the Wayne Taylor Racing succeeded at Sebring. Except for pit-stop rotation, the #3 Corvette never led a lap until it took the lead 41 laps from the finish—and once it did, it was never bested. The win wasn’t easy The #911 Porsche GT Team RSR was threatening strongly in the closing hour when a puncture and penalty for running over a hose ruined its race. Then Joey Hand in the Rolex-24-winning #66 Ford GT took up the challenge, getting within a couple of seconds of the Corvette but ultimately the Corvette was simply too fast, winning with a 4.5-seconfd margin. The #33 Riley Motorsports-Team AMG Mercedes-AMG GT3 of Ben Keating, Jeroen Blekeemolen, and Mario Farnbacher proved to be the quickest of the GT Daytona class, finishing a lap ahead of 2016 GTD champions Scuderia Corse and the surprisingly fast Sun Energy Mercedes. 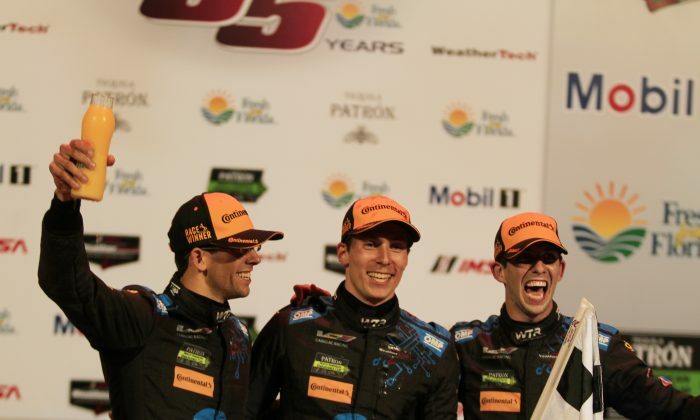 The #38 Performance Tech Oreca FLM09-Chevrolet driven by James French, Patricio O’Ward, and Kyle Masson followed up its convincing victory at the Rolex 24 with an equally impressive performance at Sebring, Finishing two laps ahead of its nearest competitor. The IMSA WeatherTech Sportscar Championship will be back in action in a few weeks with the Bubba Burger Sports Car Grand Prix at Long Beach, California on April 8. For tickets and information visit the Toyota Grand Prix of Long Beach website.